It wasn’t supposed to end like this. Nobody even expected him to play. 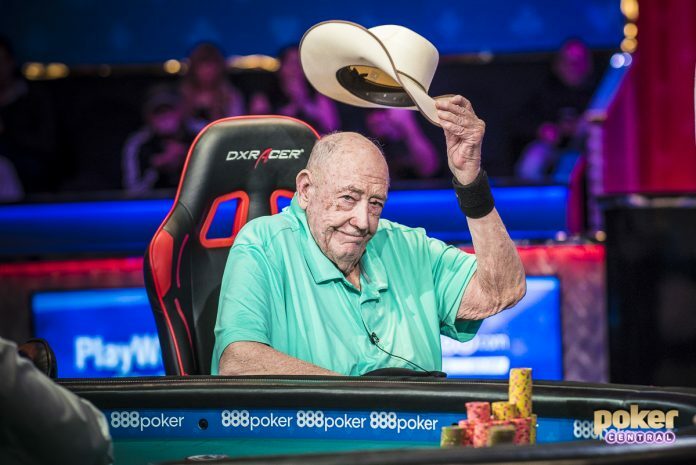 Doyle Brunson’s appearance in the $10,000 No Limit Deuce to Seven event at the 2018 World Series of Poker came as a surprise to anybody who has followed poker over the last few years. Once the face of the franchise, Brunson first stopped playing the WSOP back in 2013, citing the long hours of play as the main reason. He much preferred the high stakes cash game action at the Bellagio where could come and go as he pleased. He teased coming back in 2017, but nobody, absolutely nobody, thought they’d see him at all this year. Then came the tweet heard ‘round the poker world. Going to the Rio to play in 2-7 lowball tournament. Probably the last one I’ll ever play. Word soon came that not only was this likely going to be the last WSOP tournament he was ever going to play, but he’d also be walking away from poker at the end of the summer. His wife, Louise, wasn’t doing all that great healthwise and he wanted to spend more time with her. He said he owed it to her. He owed the poker world nothing though. He’d been front and center long before the poker boom was a thing and wrote an in-depth strategy book at a time when every pro kept their secrets as close to their chest as possible. The Super System became the most important book in poker history. So there was a Christmas Morning-like excitement when Brunson late-regged for the event and took his seat alongside some of the best players in the world. Over the 30 hours that followed, Brunson took the poker world on a journey that will now serve as an almost unbelievable prologue on a Hall of Fame poker career that includes 10 WSOP bracelets, a World Poker Tour title, that best-selling strategy book and millions of dollars won in some of the biggest cash games the world has ever known. As the field dwindled down and eventually stopped with 11 players remaining on Monday night, many poker fans and players alike started to fantasize about an 11th bracelet for the Godfather of Poker, maybe even a heads-up battle with his son, Todd, who was also still in the tournament. If this was really going to be Brunson’s last WSOP event, it would be somewhat fitting if he went out on top. On Tuesday, the 11 players quickly became eight and action moved to the PokerGO livestream. Eight became seven. At no point did it look like Brunson was going to cruise to victory, but thanks to the swingy nature of No Limit Deuce, he was never out of it until he was out of it. And then seven became six. Brunson was finished. He tipped his trademark cowboy hat to the crowd that had gathered on this trip back in time and then exited the Rio to a standing ovation. The current generation of players that are dominating poker have little difficulty looking up to Brunson the poker player but that same group has, at times, struggled to relate to or even accept some of his political or social views. Over the last few years, Brunson has often found himself defending those views. He’s gotten in hot water for tweets that touch on political or social issues. In 2015, TMZ picked up a story about Brunson’s comments on Caitlyn Jenner after she transitioned from Bruce. He’s been an ardent supporter of Donald Trump and the NRA – two topics that often polarize the poker community. In the case of Jenner, and more recently John McCain, Brunson has talked about how people who were once his heroes have since let him down. A fair number of people who once looked up to Brunson will probably say they can relate as they struggle to reconcile the difference between Brunson the poker player and Brunson the person. Nobody was going to change their view of Brunson whether he won the bracelet or not on Monday. His place in poker history is as locked in as they come and, for better or worse, this is a time where one’s political views just don’t change too quickly. For those 30 hours though, the politics didn’t matter. Only the cards did. Can’t wait for the article on Daniel Negreanu when he retires. Assuming his ardent anti-conservative views will be called polarizing as well. Brunson has been a stalwart in poker for like 60 years and half of the article talking about his last tournament deals with his support of Donald Trump.